Leading the Knights of Middle Georgia State College in scoring during preseason play. 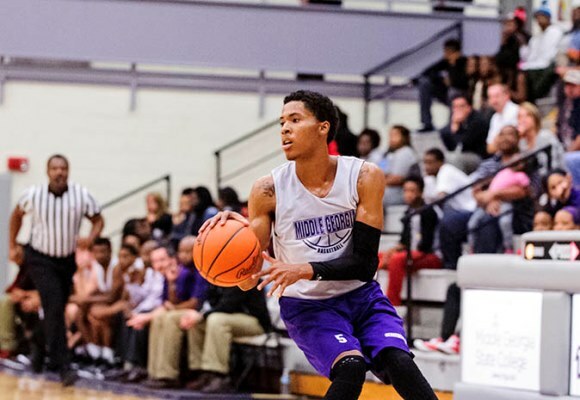 COCHRAN, GA – The Knights men’s basketball team picked up their second win in the preseason, this time against the Georgia Gwinnett Grizzlies club team. The Knights won 85-64 but led by as many as 31 in the game. The Knights were led by Seth Coleman (JR/Columbia, SC ) with 21 points (all in the first half). Alyja Hennings (JR/Alphareta, GA) scored 15 and Javaris Hooks (JR/Americus, GA) 13 to help the Knights to the win. Brandon Ingleton (SO/Woodstock, GA) added 7 rebounds and 2 blocks, all in the first half. The Knights will travel Milledgeville to take on Georgia College and State University for the final preseason game before returning home on November 4th to open the regular season. The women will play on the 4th at 5:30 PM against Cumberland University (TN) followed by the men at 7:30 PM against Voorhees College (SC) in both teams regular season openers. The Knights opened up their preseason with a 101-49 win over the former Darton State Club team turned prep academy on Wednesday night. JUCO transfer Seth Coleman (JR/Columbia, SC ) led the team with 34 points including 26 in the first half.